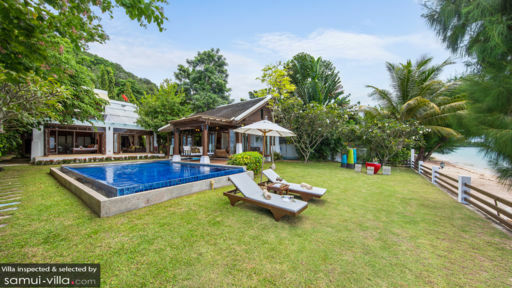 An exciting property constructed on a vast stretch of beachfronted land, The Emerald Beach Villa 4 is part of a luxurious estate in Bang Po beach, Samui. 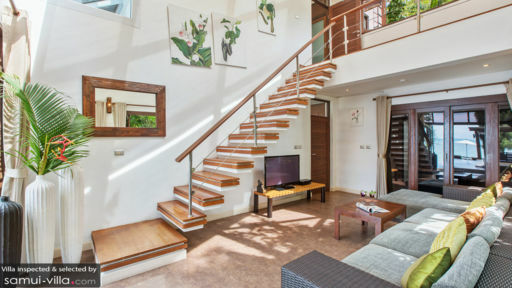 With three bedrooms, the villa offers a comfortable and relaxing ambiance for couples, small families, and even friends travelling to Thailand for a memorable holiday. There is a private swimming pool that overlooks the ocean, complete with Jacuzzi facilities for a tranquil time. The interiors are done up in a way that welds them seamlessly with the beautiful outdoors; from wherever you are in the house, you can get a splendid view of the ocean! The villa boasts of three lavish bedrooms, found in a separate pavilion with two floors. The master bedroom opens out directly to the swimming pool through large glass doors ensuring a gorgeous view when you wake up in the morning. There is a king bed in the bedroom that features an all-wood interior exuding an opulent and homely vibe. The second bedroom upstairs is similarly designed however, it has twin beds while the third bedroom has a bunk bed that suitable for kids. A gorgeous swimming pool resides snugly in the middle of verdant gardens overgrown with trees, plants, and island flowers that exalt the space multifold. You can lie back on the rattan sun chairs are while enjoying the spectacular view of the ocean right out front. Guests of the villa also enjoy an unobstructed beach access to Bang Po beach, so you get to walk along the shoreline, splash in the water, and build sandcastles all you want. The sun chairs are placed under a pergola roof, so you could take a nap in the afternoon as well. The poolside living area at The Emerald Beach Villa 4 opens out as if to the ocean outside through foldable glass doors that allow in ample natural lighting and fresh ocean air. The beautiful indoors are well-lit because of the glass ceiling that is covered by a white shed for a comforting ambiance. The room itself is furnished with a comfortable L-shaped sofa, which faces a flat-screen TV with numerous channels and a DVD player for movie marathons! The beautiful interiors are heightened owing to the gorgeous artwork showcasing a variety of tropical elements. Open to the backyard which is another luscious green sight, there is the dining area and kitchen at The Emerald Beach Villa 4, which also doubles as a cosy lounge overlooking the stunning oceanfront. The six-seater dining table stands under a large overhead light, to create a wonderful space where guests can relish a hearty meal or two. The kitchen is fully-equipped and ready for use as it is fitted with various amenities and appliances that are modern and functional. 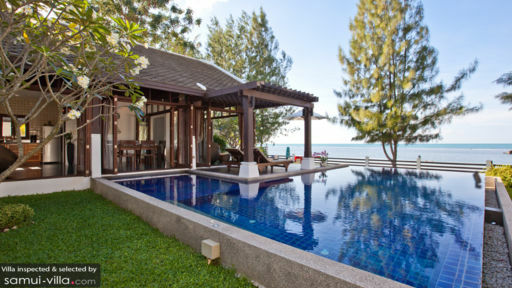 The villa is fully-staffed with housekeeper, management, pool and garden maintenance. A daily breakfast is included in your stay and for other meals you can make requests. Services like laundry, massages, car/ chauffeur, chef come at additional costs. The villa is ideally located right beside the beach, giving you direct access to its sandy and beautiful shores. The inspiring and awesome location is, in fact, great for a relaxing holiday as there is hardly anyone in sight to disturb your peace. There are restaurants like Haad Bang Po and beach clubs like 4 Monkeys Coffee Bar for you to chill at once the sun sets and you wish to unwind!